Congenital fibrosis of the extraocular muscles type 1 (CFEOM1) is known to be caused by mutations in KIF21A or TUBB3 or other known genes (SALL4, CHN1, HOXA1). However, affected children may harbor other genetic defects. Therefore, a candidate gene analysis (KIF21A, TUBB3 SALL4, CHN1, HOXA1) and a high-resolution array comparative genomic hybridization (arrayCGH) was performed in two unrelated children with sporadic CFEOM1. Two unrelated Saudi patients did not have any mutation(s) after sequencing the full coding regions of SALL4, CHN1, HOXA1, and TUBB3 genes; and exons 8, 20, and 21 of the KIF21A gene. However, arrayCGH revealed a 3.17 Kb deletion at chromosome 8p22 with copy number state equal to 1, indicating a heterozygous deletion. This deletion was absent in proband’s mother or father or 220 unrelated healthy individuals of similar ethnicity. The deletion encompassed only one functional gene, GRHL2, which encodes a transcription factor. In humans, defects in this gene are a cause of non-syndromic sensorineural deafness, autosomal dominant type 28 (DFNA28). We speculate that GRHL2 gene may have a role in orbital innervations and the defect in this gene (deletion) may be related to the CFEOM1 phenotype in these two children. 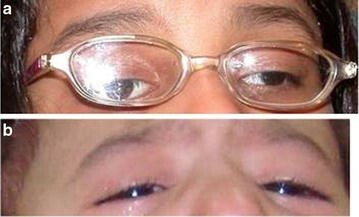 Congenital cranial dysinnervation disorders (CCDDs) include most congenital, static abnormalities of ocular motility and certain additional syndromes primarily involving lid and facial muscle innervations . Individual CCDDs can be sporadic (e.g., most Duane retraction syndrome) , autosomal dominant (e.g., congenital fibrosis of the extraocular muscles type [CFEOM] type 1 or 3 [3, 4], autosomal recessive (e.g., the HOXA1 spectrum or CFEOM2 [5, 6], or chromosomal in origin . Certain types of CCDDs affect only ocular motility (e.g., CFEOM1), however, several other types of CCDDs are now known that exhibit non-ophthalmic associations involving neurologic, neuroanatomic, cerebrovascular, cardiovascular, and skeletal abnormalities as reviewed elsewhere . Studies in the past have associated syndromic CCDD with chromosomal copy number variations (CNVs) including deletion(s) [9, 10], duplication(s), translocation(s)  and the presence of 22 marker chromosome . The methods employed in these studies had a limited resolution of 5–10 Mb for standard karyotyping, 3–5 Mb for FISH probes, or 80–200 Kb for BAC clones. In contrast, currently available high-resolution array comparative genomic hybridization (arrayCGH) has the ability to detect small and potentially symptomatic CNVs into the range of 1 Kb. Using this approach, we have identified different CNVs in several patients with syndromic Duane retraction syndrome [7, 13–15]. In this report, we describe two unrelated Saudi patients with CFEOM1, both of whom did not have detectable CCDD mutations by candidate gene analysis, but harbored a similar recurrent CNV deletion in the Grainyhead Like transcription factor 2 (GRHL2) gene (Gene ID: 79977). The study was conducted under an institutional review board ap-proved protocol for genetic study of eye movement disorders at the King Khalid Eye Specialist Hospital, Riyadh, Saudi Arabia (0424-P). Written, informed consents were obtained from all participating individuals. Informed consents were signed from both the proband’s parents. The patients were examined clinically and their medical records were reviewed (as detailed in Results) at the Ophthalmic Genetics Laboratory, King Abdulaziz University Hospital, King Saud University, Riyadh, Saudi Arabia from December 2014 through June 2015. All the exons of SALL4, CHN1, HOXA1 and TUBB3 genes were sequenced according to the protocol described previously . In addition, exons 8, 20, and 21, considered as mutations hotspots in KIF21A gene were also sequenced as previously described in details . The Affymetrix Cytogenetics Whole Genome 2.7 M array (Affymetrix Inc., Santa Clara, CA, USA) was utilized to look for chromosomal alterations (deletion(s) and/or duplication(s)) in the whole genome as detailed elsewhere [13, 15]. Affymetrix Chromosome Analysis Suite v1.2 (ChAS) Software (Affymetrix Inc. CA, USA) was used for arrayCGH data analysis. As currently, there is no internationally accepted consensus for analyzing data generated by high resolution arrayCGH, we devised our own . Accordingly, a CNV had to satisfy the following criteria’s to be considered as potentially pathogenic: (1) CNV has to be absent in the Database of Genomic Variants (DGV; http://projects.tcag.ca/variation/) among normal controls; (2) has to be absent in our own database of unrelated healthy controls of Saudi ethnicity. So far, we have analyzed 220 normal controls by arrayCGH; (3) the detected variant has to segregate with the phenotype and should not be present in unaffected or asymptomatic family members; and (4) it included an area of the genome encompassing one or more functional gene(s). The threshold for gain or loss was adjusted to 10 Kb. We used the National Center for Biotechnology Information Human Genome Assembly Build 35 as a reference. A semi-quantitative polymerase chain reaction (PCR) method was performed on the ABI 3130xl Genetic Analyzer (Applied Biosystems, Foster City, CA, USA) to confirm the arrayCGH findings by measuring the sizes and fluorescence peak intensities of the gene encompassing the chromosomal variation as described previously [13, 15]. Patient 1 is a 5-year old girl and was the 5th of six siblings born to non-consanguineous parents. Pregnancy and delivery were unremarkable, and there was no family history of strabismus. The girl adopted a chinup position and left face turn for fixation with her preferred right eye (Fig. 1a). Visual acuity was 20/30 in either eye. In forced primary position there was bilateral mild hypotropia and an exo-tropia of approximately 50 prism diopters with almost complete ophthalmoplegia (only limited abduction in the right eye and limited abduction and adduction in the left eye). There was also bilateral mild true ptosis. Pupils were miotic (23 mm) but dilated well with anti-cholinergic drops. Cycloplegic refraction and fundus examination were also unremarkable. There was no evidence for decreased hearing or anterior segment abnormalities. Patient 2 is a 22 month old boy who is the 5th child of first-cousin parents. Pregnancy and delivery were unremarkable with no family history of strabismus. The boy adopted a chinup position because of bilateral hypotropia with inability to elevate both eyes and bilateral moderate true ptosis (Fig. 1b). Extraocular motility was otherwise difficult to assess because of cooperation issues, but there was mild horizontal ophthalmology as well. There was no Bell phenomenon. There was no evidence for ocular preference. Pupils were normal. Fundus examination was grossly normal and there was no significant refractive error. Hearing was normal and there was no anterior segment abnormalities. No sequence change or mutation(s) were detected in SALL4, CHN1, HOXA1, and TUBB3 upon sequencing the entire coding region of these genes. Similarly, no variations were detected after sequencing exons 8, 20, and 21, the known hot-spots of the KIF21A gene. We initially detected a total of 37 CNVs (14 deletions and 23 duplications in different chromosomes). Of these, 15 (40.5%) were detected in the asymptomatic father and 13 (35.1%) in the asymptomatic mother and these variants were thus eliminated from further analysis. Of the remaining 9 CNVs, 8 (88.8%) were detected in our database of full genome CNVs from 220 normal controls of similar ethnicity and were thus filtered out. The remaining CNV that deemed important was a deletion in chromosome 8 extending from 102,670,305 to 102,673,473 (size = 3.17 Kb) at the 8p22 cytogenetic band. The copy number was equal to 1, indicating that this deletion was likely to be heterozygous. This deletion was likely to be due novo and segregated with the syndrome described here because it was not detected in the proband’s mother or father or 220 unrelated healthy individuals of similar ethnicity. No other known or potentially pathological chromosomal copy number changes were detected in this patient using the criteria detailed in the method’s section. The confidence value calculated by the ChAS software was 88% with a marker count of 20 spanning the deleted area. This is a good number of markers in the deleted area and give confidence of the deletion present in this region. The deleted area on chromosome 8 was confirmed by semi-quantitative PCR as detailed in the methods. The mean (standard deviation) of three separate readings of fluorescence peak area was 653.4 (9.8) for the proband, 898 (9.5) for the mother, 917.9 (24.5) for the father, and 895.2 (16.1) for a normal male control of similar ethnicity. This 3.17 Kb deletion region encompassed only one functional gene, GRHL2. The protein encoded by this gene is a transcription factor that can act as a homodimer or as a heterodimer with either GRHL1 or GRHL3. Defects in this gene are one of the genetic causes of non-syndromic sensorineural deafness, autosomal dominant type 28 (DFNA28). Although CFEOM1 is mainly caused by KIF21A or TUBB3 mutation(s) , there are previous reports indicating that affected children from the Arabian Peninsula sometimes do not harbor detectable mutations in either gene [16, 17]. In two such children from two different families we report a small deletion encompassing GRHL2 and suggest that it may have been related to the phenotype. To our knowledge, the two patients are not related and both belong to different tribes from different parts of the Kingdom. GRHL2 is a mammalian homolog of Drosophila protein grainy head (GRH), which is part of a family of transcription factors that play a role in epithelial morphogenesis . The development and cell maintenance of the vertebrate eye requires the synchronized action of number of genes including many transcription factors . Mutations and deleterious changes in these genes encoding transcription factors could hamper the developmental regulatory networks and may result in general developmental defects associated with eye-related problems [20, 21]. GRHL2 knockout is embryonically lethal in mice, causing severe facial and neural tube defects ; and mutant zebrafish exhibit inner ear defects and abnormal swimming positions . These studies clearly establish a crucial role of GRHL2 in embryonic development, and our finding of GRHL2 deletion in two unrelated CFEOM patients suggests a role for the gene in orbital innervation. An involvement of GRHL2 in other physiological processes have also been described. GRHL2 (alias TFCP2L3, MIM 608576) mutation has been reported in childhood-onset progressive autosomal dominant hearing loss [DFNA28 (MIM 608641)] ; however, there was no evidence for hearing loss in either of our patients. Homozygous mutations in this gene have been implicated in an autosomal- recessive ectodermal dysplasia syndrome . Besides, other polymorphic sequence variants in GRHL2 have also been implicated in age-related hearing impairment and noise-induced hearing loss [26, 27]. Interestingly, GRHL2 has been shown to regulate transcription factor zinc finger enhancer binding protein 1 (ZEB1) . Mutations in ZEB1 are known to be pathogenic causing posterior polymorphous corneal dystrophy-3, late-onset Fuchs endothelial corneal dystrophy, and keratoconus . However, there was no evidence for corneal disease in either of our patient. It has been shown that, GRHL2 and ZEB1 transcription factors form a double negative regulatory feed-back loop [28, 30]. In addition, ZEB1 transcriptionally represses genes of the miR-200 family, and that GRHL2 up-regulates the expression of miR-200b/c family members in breast cancer cells . Based on our finding of GRHL2 deletion observed in our patients with CFEOM, it is possible that the highly complex, interconnected GRHL2/ZEB1/miR-200 regulatory system may be involved in orbital innervation . Development of normal ocular motility is a complex process that is not yet fully understood. Although an in-depth genetic screening using both candidate-gene and a genome-wide approach was conducted, the conclusion of this study is based on observation in only two cases with CFEOM1. A more firm link between the GRHL2 gene and this syndromic CCDD variant may be established in the future if these observations are replicated in more patients. Other genetic abnormalities not tested for by the techniques employed here could be responsible for this syndrome. Lastly, the role of epigenetic or environmental factors in contributing or directly causing this phenotype has not been ruled out. KKA: study design, data analysis, interpretation, and manuscript preparation; AAK: sample preparation, performed experiments, manuscript preparation; AOK: study design, clinical examination, clinical data, and preparation of final version of the manuscript. All authors read and approved the final manuscript. The authors would like to thank the Deanship of Scientific Research, Glaucoma Research Chair at the King Saud University for supporting this study. Parental consents were obtained to publish images for both patients. The study adhered to the tenets of the Declaration of Helsinki with approval from the Institutional Review Board and Research Ethics Committee of King Khalid Eye Specialist Hospital, Riyadh, Saudi Arabia (Approval # 0424-P). Written, informed consent was obtained from both the patients’ parents prior to inclusion in the study. This work was supported by King Saud University, Deanship of Scientific Research, Glaucoma Research Chair; but had no role in the design of the study and collection, analysis, and interpretation of data and in writing the manuscript.